On board of a private van, we will pick you up at your hotel lobby to take you upon an unforgettable adventure journey. Our first stop will be Tulum. 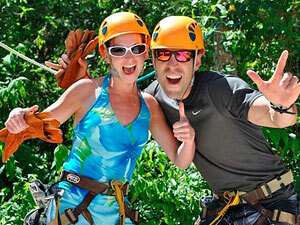 At this place, you will be accompanied by a specialized bilingual tour guide. 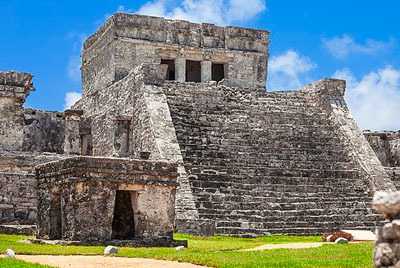 You will be transported back to the Pre-hispanic times while you are listening to the history of this great ancient Mayan City and its importance within the mayan culture. Walled City its first vestiges were found dating from 564 B.C., a place where besides of having one of the most stunning turquoise-blue water Oceanfront view, share its natural and cultural treasures alongside the second largest Coral Reef in the World. 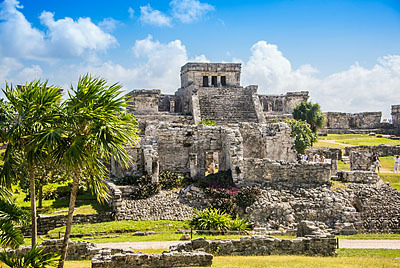 A journey which will take us around two hours where besides of learn about the Mayan Culture, you will be allowed to discover Tulum on your own! So, do not forget to bring your swimsuit! If you are a nature-lover, then you cannot lose this big opportunity to visit Akumal, a natural beauty protected area that hides into its warm turquoise-blue waters an amazing and immense underwater world such as: multi-colored fish species, natural sinkholes with crystal clear water, underground caverns and rivers, lagoons and of course, the home of this fascinating marine turtles. You can swim alongside the Marine Turtles and learn how to care of them. Akumal is the perfect place to practice snorkeling and is considered one of the best family destinations as well! Located in the heart of the "Riviera Maya", you can be able to rest or just relax on its extended white sand beaches, you will experience a completely natural experience for sure. This private tour is appropriate for people of all ages. However, for safety reasons the snorkeling activity can be restricted to pregnant women, or people with any healthy problem which inhibit them to practice moderate physical activities such as swimming. Under-age participants must be always accompanied by a responsible adult. It is recommended that people will take the snorkeling tour, should have a basic swimming knowledge previously. Bring swimsuit and towel and a extra change of clothes if is necessary.